The Red-Throated Loon is the most common of the Loon family. They can be up to 26 inches long. They are the smallest species of all known Loon species in the wild. They are very good at flying with speeds of up to 48 miles per hour. They have high endurance so they can fly for a very long period of time. They offer a gray coloring on top and then white on the bottom of the body. As you can guess from the name, they have a reddish patch. However, it isn’t present all year long only during mating. That is why they are often mistaken for other breeds of birds when that coloration is missing. Red-Throated Loon is found throughout the Northern Hemisphere. They live mainly along the water and will very seldom be on land. This is a bird that takes part in seasonal migration. They do so for mating though and not to get to warmer climates. In fact, they thrive in the Arctic locations. They tend to stay very close to the shoreline when they migrate. The feet on the Red-Throated Loon are located very far back so they can’t walk on land. They do cover ground though after breeding to get to the water by pushing with their feet and moving along their breast. They are able to take off in flight by land though if they are scared. They are the only species of Loon that is able to do this. Sometimes they will hide their heads in an effort to blend into the surroundings and not be seen. They go through a molt period when they can’t fly. This is due to a molt in the late summer months. They use various forms of vocalization to communicate. They will send out sounds to identify habitat as they approach the water. They give warning calls if they are disturbed to ward off people and predators. They will also offer a low pitch for contacting mates or to interact with their young. They consume a variety of foods including fish and crustaceans. The Red-Throated Loon prefers fish though and that is the item they will always eat if it is there. They will turn to insects, plants, and other debris when necessary though in order to get enough food to eat. They often dive to get fish right out of the water. They have amazing vision that allows them to see fish from a very far distance. They can dive up to 30 feet below the surface of the water. They are able to stay under the water for up to 1 minute at a time. Breeding takes place mainly in the Arctic region. The pairs are very careful about determining who they will mate with. They often keep the same mate for several years but they can change who they mate with. Both parents will guard the eggs and help to ensure that they are able to mature. The female lays two eggs and incubates them for 24 to 29 days. When the young arrive the mother often stays with them while the father will bring back food for all of them. 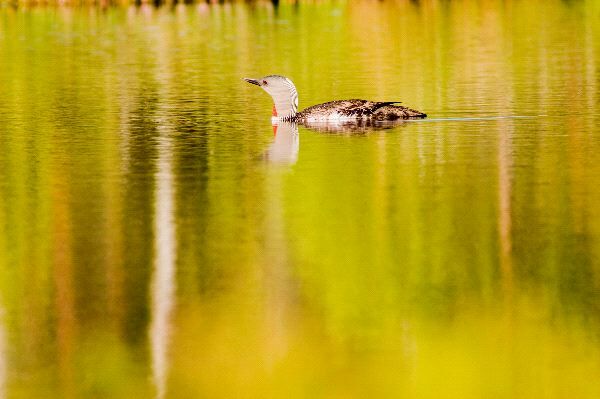 Even though the Red-Throated Loon is considered to be at a low risk of extinction they are still guarded in many regions. They are part of various treaties that make it illegal to hunt them. However, they can be easily mistaken while hunting if that red patch is missing. They also get tangled up in fishing nets found in the water.